Squabbles over legal representation for Nnamdi Kanu, leader of the Indigenous People of Biafra (IPOB), on Monday, stalled his trial for alleged treason at the federal high court, Abuja. Vincent Obetta, Kanu’s lawyer, who has represented him since the beginning of his trial at a lower court, was not in court, but another lawyer, Ifeanyi Ejiofor, who claimed that he had been hired to represent the IPOB leader, showed up. A mild drama ensued as Kanu’s younger brother, Emmanuel asked Ejiofor to leave, impressing it on him that Obetta was the legitimate counsel of his brother. Ejiofor tarried a while, but left afterwards. 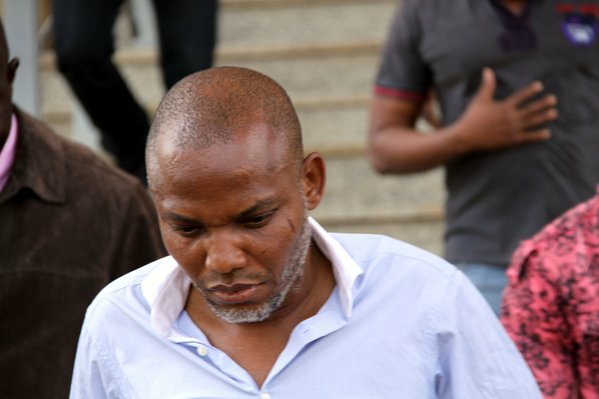 The case, however, did not come up, and Obetta told TheCable that the Kanu family was still trying to sort out issues regarding legal representation for Kanu, who has been in detention since October 14, 2015. On December 23, 2015, Kanu had refused to take his plea before Ahmed Mohammed, justice of the federal high court, Abuja, citing lack of confidence in the court. This was after Adeniyi Ademola, another justice of the federal high court, Abuja, ordered the Department of State Services (DSS) to release him unconditionally, and after a chief magistrate court discharged and acquitted of charges of criminal intimidation and ownership of unlawful society. Meanwhile, Obetta has refuted reports that Kanu is ill, and that he is being tortured in custody. According to him, Kanu is in high spirits and healthy.